A recent trip to San Miguel Mexico inspired this colorful wall hanging. the bright yet simple floral applique adds an extra touch to this stacked bricks piece. 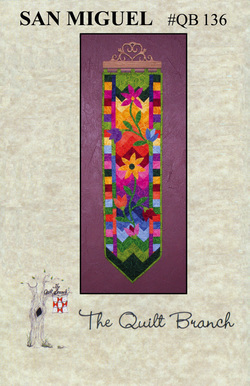 We can also see using the applique as poinsettias for your Christmas wall hanging. The piece measures 11 1/2" X 42" and uses 1 fat quarter and 15 fat eights.